Composed in 1970 and dedicated to Rostropovich, who also performed its original premiere, the cello concerto “Tout un monde lointain” by Dutilleux is one of the most demanding and influential cello concertos of the 20th century. 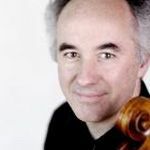 Gustav Rivinius performed the work last week in Saarbrücken’s Congresshalle alongside the Deutsche Radio Philharmonie under Tito Muñoz, affirming yet again his reputation as one of the greatest cellists of our time. His performance left the audience erupting in enthusiastic applause and garnered the following praise from the press: “While there was no doubt that Rivinius would be in full command of the enormous technical demands of this piece, the gruelling escapades on the fretboard, tedious double stops and cantilenas in the highest positions, it was the contrast between his powerful forte playing with the contemplative intensity of the quiet passages that proved the most captivating” (07 March 2016). It took Gustav Rivinius a mere five bars to carry his listeners off to the “far away world” (“Tout un monde lointain”) conveyed in the piece – an experience concert-goers will not soon forget.